What Day Of The Week Was March 25? 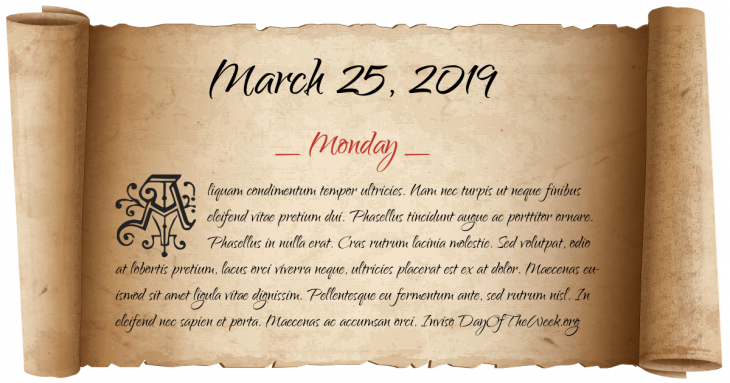 March 25, 2019 was the 84th day of the year 2019 in the Gregorian calendar. There were 281 days remaining until the end of the year. The day of the week was Monday. The first settlers arrive in Maryland. Percy Bysshe Shelley is expelled from the University of Oxford for publishing the pamphlet The Necessity of Atheism. (Julian Calendar) Traditional date of the start of the Greek War of Independence. The war had actually began since 23 February 1821. The date was chosen in the early years of the Greek state so that it falls on the day of the Annunciation of the Blessed Virgin Mary, strengthening the ties between the Greek Orthodox Church and the newly-found state. Protesters demanding a new election in Belarus, following the rigged Belarusian presidential election, 2006, clash with riot police. Opposition leader Aleksander Kozulin is among several protesters arrested. Who were born on March 25?